While arguments and counter-arguments continue on the recent Court of Appeal judgment on the percentage of pictorial warnings on cigarette packets, a group of medical officers, together with villagers have been silently conducting awareness programs to change the mindset of people with regard to tobacco. This probably is the first program of its kind in Sri Lanka where officials, villagers and community leaders got together to make a change while being with the people. 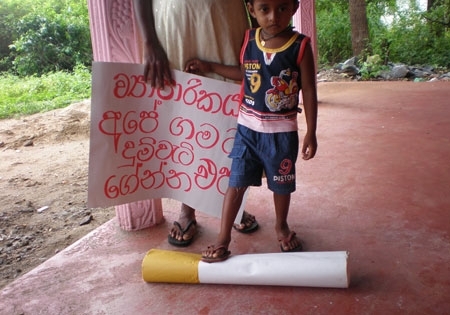 A team of medical officers in several parts of the Moneragala District have got together with villagers, community leaders and religious leaders to change the people’s attitude towards tobacco and cigarettes. This awareness program has been conducted over the past one and a half years in several areas including Buttala, Maharagama and Wellawaya Pradeshiya Sabha Divisions. During the initial stages, the awareness campaign did not target tobacco usage or smoking. “We initiated such a campaign to enlighten the public on the ill-effects of certain food items sold in shops. However, we later realized that tobacco usage was a matter of serious concern that needed immediate attention,” Medical Officer of Health (MOH) in Buttala, Dr. S.H. Piyasumana told The Nation. The campaign is not backed by any organization or health authorities. “We do it on our own, with the support of the villagers,” he said. He pointed out that cigarette was not an entity that was chosen by the people. Instead, he said, it was forced upon by the industry. “In the past, people used to chew betel leaf. Tobacco, however, was not chosen by the people as an alternative, but was forced on us by the industry,” he said. “We started off by looking at why tobacco was needed in the first place. We conducted several programs to tell the people on the ill-effects of tobacco. It has worked so far,” he said. The campaigns have so far yielded positive results simply due to the fact that the campaign was straightforward and was carried out among the people. According to Dr. Piyasumana, only 40% of the retail sellers continued to sell cigarettes in Wellawaya. “When we carried out a survey before the program, 96% of sellers sold cigarettes. It has now come to 40%. We consider this as a success,” he said. However, the campaign was not a smooth run either. Dr. Piyasumana said convincing the people was quite a challenge at the initial stages. What has made the campaign effective is the support extended by the retailers. Dr. Piyasumana stated that the majority of the retailers had backed the campaign by stopping tobacco sales, and not giving into pressures exerted on them by agents. Sarath Gamini, a retailer in Wellawaya said that he, along with several other retailers had stopped cigarette sales due to the effective campaigns. “I used to sell cigarettes about three to four years ago. But, the reason was that we were never made aware of the ill-effects of tobacco. Now I know. Human lives are important than business and money,” he said. Right now, the target is to stop the remaining 40% of retailers from selling cigarettes. However, Dr. Piyasumana stated that it was not as easy as it sounds. Apart from trying to convince the public, the challenge was to tackle the cigarette agents who had deployed numerous methods to sabotage attempts made by the organizers of the awareness program. Accordingly, the agents had adopted numerous methods to discourage retailers from stopping cigarette sales. “One such method was to stop buying other stuff from the particular shop if it doesn’t sell cigarettes,” said Gamini. “There is pressure. However, we as a community have got together in fighting such obstacles. The moment people stop buying cigarettes, the agents too will have no choice but to gradually reduce supply,” he added. However, the campaigners adopted methods that they believed could counter the measures adopted by the agents. “We adopted numerous methods to create awareness. We conducted a poster campaign; we also conducted street dramas that conveyed a strong message on the usage of tobacco. These measures had an impact on the people and now they consider smoking as an anti-social activity,” Dr. Piyasumana added. The Court of Appeal on May 12 allowed the Health Ministry to cover 50-60% of all cigarette packets with pictorial health warnings. The decision has evoked mixed reactions, with anti-tobacco promoters claiming that the decision would benefit the industry. The Alcohol and Drug Information Center (ADIC) stated that the issue was far from resolved as the Court had only suggested a range. “The industry would try to stick to the minimum. Therefore, the matter needs further discussion,” said Executive Director, ADIC, Pubudu Sumanasekara. However, experts also point out that tobacco cannot be eradicated by laws and policies alone. Lecturer in Health Promotion at the Rajarata University Dr. Manoj Fernando pointed out that the important aspect of anti-tobacco campaign was to change the mindset of people. He however pointed out that as far as Sri Lanka was concerned, almost everyone was for the eradication of tobacco usage. “Even smokers have backed the moves to curtail tobacco usage. They know that it is addictive, and they want to come out of it,” he said.